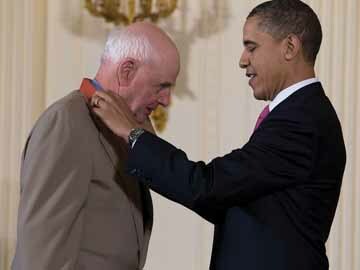 Wendell E. Berry receives a 2010 National Medal of Arts and Humanities from President Barack Obama. The writings, research materials and incoming correspondence of acclaimed Kentucky author Wendell E. Berry have been donated to the Kentucky Historical Society (history.ky.gov) and soon will be publicly available. Berry, 78, is well known as an American man of letters, an academic, a cultural and economic critic, and a farmer. He is a prolific author of at least 25 books of poems, 16 volumes of essays and 11 novels and short story collections, many of which depict the fictional small Kentucky town of Port William. Berry’s influential writing is grounded in the notion that one’s work ought to be rooted in and responsive to one’s place. After education and teaching took him across America and to Europe, the Henry County native returned to farming in young adulthood and has been called a “prophet of rural America” in The New York Times. He has taught writing at numerous universities, including the University of Kentucky, Stanford University, Georgetown College, the University of Cincinnati, New York University and Bucknell University, and been the recipient of many awards. There is even a body of work by other authors about Berry’s writing. He also has a decades-long history of public activism, and as recently as February 2011 spent the weekend locked in the Kentucky governor’s office with 14 others demanding an end to mountaintop removal coal mining. Berry donated 75 boxes to KHS – which is named for the late Kentucky historian Dr. Thomas D. Clark, who taught Berry. Materials cover literary and cause-oriented topics for writings that resulted in publications and those that did not. A condition of Berry’s gift to KHS during his lifetime restricts access to his personal writings to researchers who obtain his consent. All other materials will be accessible to the public once they have been cataloged by KHS archivists, who say it will ready Nov. 1. This winter, while her husband is serving his country overseas, Ali Larson will be tackling a big project of her own. The wife of U.S. Army Capt. Chris Larson is the first student to receive a University of Louisville graduate scholarship for military spouses. She’ll get free tuition, a 20-hour assistantship and a $1,200 monthly stipend while she pursues a master’s in social work. UofL created the scholarship after having observed that military spouses nearly always have to put their education on hold in support of their husband or wife, said Renee Finnegan, who directs UofL’s Office of Military Initiatives and Partnerships. “This helps one partner advance along his or her career path while the other partner is actively serving, so both can move ahead in their chosen field,” Finnegan said. Larson, 27, is a former English teacher who often saw middle-school students struggle in tough situations at home that she could not fully address in the classroom. Her new degree, however, will put her in a position to help. We salute Larson’s commitment to entering the fray. And we salute UofL for backing her. Finnegan can be reached at (502) 852-2153 if you want to know more. Our cover story in August on the state’s signature Thoroughbred agribusiness industry featured a few photos that focused on its “crop,” yearlings heading toward the sales ring being hand-walked as part of their training. Those photos, however, did not really capture what is another of Kentucky’s signature characteristics: the beauty of the Thoroughbred farm itself. We are taking the opportunity here this month to include just a smattering of images from Three Chimneys Farm, located west of Lexington on Old Frankfort Pike. It’s an essential part of what continues to draw the world’s attention to our fair state. Teams of students at the University of Kentucky, the University of Louisville and the University of Pikeville are now forming to take on the task of generating jobs in Eastern Kentucky. They will present their ideas Jan. 19 in a business plan competition created in May by Pearse Lyons, president of Alltech, the Nicholasville-based global animal health and nutrition company, who will present the winning team a $20,000 prize for their university’s business school. Lyons tasked the teams with coming up with a framework for innovation, economic development and entrepreneurship in nine high-unemployment counties: Bell, Floyd, Harlan, Johnson, Knott, Letcher, Magoffin, Martin and Pike. Lyons is an entrepreneur being entrepreneurial about entrepreneurship. Now that’s a great idea. 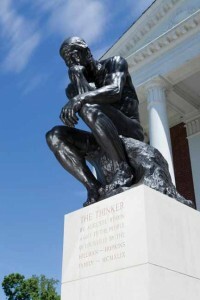 On Feb. 18, The Thinker returned to a new pedestal in front of Grawemeyer Hall at the University of Louisville. Since 1949, a bronze of sculptor Auguste Rodin’s famed “The Thinker” has inspired University of Louisville students, faculty and city residents with its pensive gaze from a pedestal in front of the Grawemeyer Hall. Attorney and former city alderman Arthur Hopkins bequeathed the work overlooking the oval lawn on Third Street as gift to the people of Louisville. Hopkins’ will instructed that the copy of “The Thinker” obtained be “colossal” in size. It was purchased for $22,500 from the Walters Art Museum in Baltimore, whose founder Henry Walters bought it in 1905 after its display at the 1904 World’s Fair in St. Louis. It was the first large cast copy of what is one of the world’s best known works of art, according to UofL art historian Christopher Fulton. A center of campus activity almost immediately, UofL students have included The Thinker in celebrations, protests, pranks and made him a character in theatrical works. He has briefly changed color repeatedly, but paint removals took with them the original patina. In December 2011, during a major campus renovation, the beloved work left his post for conservation. Experts cleaned the sculpture, gave it a new layered patina based on that found on other copies, then added a protective layer of wax. On Feb. 18, The Thinker returned to a new pedestal in front of Grawemeyer Hall. Rodin’s again-gleaming masterpiece is back at work, stimulating this and future generations to continue lifting their gaze, their aspirations and their accomplishments. Welcome back!